This is an in-depth exegesis of Romans 11:25f proving the first century fulfillment of Paul’s promise “all Israel shall be saved.”! Ken Palmer is a frequent critic and poster on the FaceBook page, “Full Preterism: A Thing of the Past.” Recently, he posted an article – evidently by “Rivers of Eden” an advocate of what is known as the Israel Only theory – attempting to refute Covenant Eschatology by an appeal to Romans 11. I appreciate the tenor of Mr. Palmer’s post, save the bit of sarcasm at the beginning. Nonetheless, Mr. Palmer (?) has produced a thoughtful article, and I am more than happy to respond. I am including the entirety of his post, followed by my response. If I were a full preterist, I would be I/O. But I’m not, and neither am I a supersessionist. Below is an exegesis (yes, that’s right, read closely Don as to what a “light” exegesis looks like and what we are expecting of you each time you make an assertion. Rivers O Feden, kudos to you for taking full preterism to its logical conclusion. Ever since the dawn of the church, tensions regarding the law and grace become the center of attention, and the 21st century church is just as susceptible as the church was in 1st century Rome. Once a Pharisee (Acts 23:6), the Apostle Paul knew all too well the struggle between the balance of obedience and freedom from the law to the point of him incessantly lamenting over his own crisis of faith (Rom. 7:8, 11, 15-20, 23). Yet, as John M. G. Barclay, an advocate of the New Perspective in Paul, notes, that it is in Paul’s epistle to the Roman church where these ideas are brought to the forefront of his Christological dissertation regarding Israel, the Jews and Gentiles, and how God’s promises “serve up the incongruity between the mercy of grace of God and the status or worth of its recipients.” Paul deliberately settles on a phrase that has been a continuing discussion for centuries regarding the identity surrounding who “all Israel” is in Romans 11:26. Paul claims that Gentiles, without the law, are incorporated into Israel’s commonwealth and heirs to the promises God had initially made to Abraham (Rom. 4:13, 17). Likewise, this Israel, is guaranteed with certainty their place in God’s soteriological plan of reconciliation through His Son Jesus Christ, because they too are descendants and heirs of the promise (Rom. 9:1-5), but only through a genuine faith in the Messiah’s redemptive work. The ethno-religious identities of Jewish and Gentile Christians clashed during the infancy of the church. Fortunately, the task was given to Paul to unpack the divine mystery for both groups, as Barclay puts it, by demonstrating “this incongruity has all along been basic to the identity of Israel, that it is presently at work in the puzzling impact of the good news, and that it will finally determine the future of Israel and of the world.” Furthermore, upon closer examination, it is discernible to posit that “all Israel” in Romans 11:26 is a theological term referring to the remnant elect of the nation in toto, and Paul’s use of the Old Testament in the epistle to the Romans leads up to and supports his overall argument that the reunification of the house of Israel with the house of Judah is the result of the “fullness of the Gentiles,” to which advertently is, the return of the ten tribes under Jesus Christ, thereby fulfilling God’s soteriological promises to Israel. God’s promises are realized in this dually-thematic mission for anyone who believes in the efficacy of His Son, whether Jew, Gentile, or Israelite (Romans 1:16; 9:33; 10:4, 11; cf. John 3:16; 5:24; 6:40, 47; 11:25; 12:44; Acts 10:43; 2 Pet. 3:9; 1 John 5:1). Paul introduces himself (Rom. 1:1) as servant and apostle of Jesus, contending that his Gospel was promised by God through the prophets (1:2) and closing the epistle with claims that it is the revelation of a mystery “kept secret for long ages, but is now disclosed” having been made available to the nations (16:25-26) by his preaching (16:25a) of the Scriptures (16:26a). He is the same Paul who wrote to the Corinthians (1 Cor. 1:1; 2 Cor. 1:1) and was a Pharisee of Judaism and persecutor of the church (1 Cor. 15:9), who witnessed the risen Christ on his way to Damascus, targeting the followers of Jesus (Acts 9:3-8; 1 Cor. 15:11). When Paul visited Corinth in AD 57-58 (Acts 20:2-3) he wrote the epistle to the Romans as not only a theological treatise asserting that Christianity is the only path to salvation for these two ethnic groups, but also as a response to Gentile arrogance towards Jewish Christians and their customs, climatically resulting in his statements made in Romans 9-11, specifically 11:25-27, that it is only because of Israel, Gentiles are included in God’s promises. In AD 49, Emperor Claudius expelled Jews from Rome, and with Gentile Christians left to run the churches there, Jewish converts eventually returning from exile clashed over the rituals of the Judaic faith. Gentiles had become arrogant towards Jewish customs and their presumed ethno-theological superiority. In other words, because they were Gentiles and under grace, they did not have to follow the requirements of the law and believed to be superior to the Jews. Andrew Das says that the olive tree imagery “confronts gentile arrogance,” and because this image dismisses any “possibility of gentile superiority over the Jew,” Gentile’s freedom predicated in God’s grace is only because of the promises He had made to Israel. Das goes on to say that the “gentile branches do not support the Jewish roots, but rather their roots support the gentile branches.” Paul layers the letter as a response to this controversy by repurposing a variety of Old Testament passages in order to quell the conflict, highlighting the theological certainty and characteristic to their soteriological identity, that under Jesus Christ as Lord and Messiah, Gentiles, along with the Jews, were heirs to the promises of God made to Israel. Even though Jews and Gentiles were two different ethnic groups, they are nevertheless enjoined together by their status in Jesus Christ because of faith, and anyone who calls on His name is saved (Rom. 10:9-14). Paul goes to great lengths in order to distinguish Gentiles from Jews or Israelites by his subtle use in designating these distinctions categorically. For Paul, Jews or Judeans seem to refer to an “ethnical or social designation, juxtaposed against his use of Israel, which appears to “carry more of a theological quality denoting God’s elect people.” Paul uses the term Israelite for himself (2 Cor. 11:22; Rom. 11:1), and Jews in his present day would agree that they were Israelites. However, Paul said that not all Israelites are Israelites (Rom. 9:6), and in order to become a “true” Jew in every sense of the word, one must become circumcised, not in the flesh, but from within (Rom. 2:28-29). In Romans 4, the apostle further supports his claim for inward circumcision by focusing on Abraham’s justification prior to the ritual (Rom. 4:1-3). The patriarch was chosen by God beforehand, and his circumcision years later was a sign of God’s promise to him as opposed to Abraham’s faith in God. Glenn Miller’s work on Romans 4 says that the goal was for Abraham to be the “ancestor of all who believe.” This encompasses those who were not circumcised “in the flesh” and “have righteousness reckoned to them.” Likewise, this incorporates those initially engrafted into God’s promises through the rite of circumcision who, as Miller contends, “follow the example of the faith” Abraham had originally displayed. Gentiles were judged by an “inward law” (Rom. 2:14-16; cf. Acts 17:23-31), and Paul’s mission to the nations was to proclaim that believers throughout the known world were included in God’s promise to Abraham (Gen. 12:2; 17:4; 22:17-18; Psa. 2:8; Isa. 42:1, 6; 49:6; Zech. 14:16; Eph. 3:1-6; cf. Rom. 11:1; Gal. 3:25-29; Eph. 2:1; see Jonah 3:1; Matt. 1:5-5; Luke 3:31-32). Since Paul’s ministry was to proclaim the Gospel of Jesus Christ, whether Jew or Gentile, one’s faith in Him is the catalyst for election status and heirs to those promises made to Israel (Rom. 10:9-14; 11:23; cf. Joel 2:32). In Romans 9, Paul says that only a remnant of Israel would be saved by grace (Rom. 9:27; cf. Isa. 10:22), and it is here that Paul summarizes the history of Israel’s election in regard to their ‘hardening’ resulting in exile and rejection. When the northern kingdom, the house of Israel, lost their status as God’s elect because of idolatry and disobedience, having been dispersed by the Assyrians, Judah was then left to take up the mantle in being a “light to the nations,” a task disposed to them from the beginning (Isa. 42:6). Yet, Judah too became hardened prior to and after its return from the Babylonian exile (idolatry – Jer. 1:16-19), seeking righteousness through a system of works as opposed to faith (Rom. 4:16; 10:3), stumbling tragically when Christ came to offer Himself up as their predicted Messiah (Rom. 9:30-31; cf. Isa. 8:14). Israel’s restoration is catalytically predicated in the Gentile mission (cf. Luke 2:30-34; Acts 1:6-8; Rom. 11:25-27) and the dispersed house of Israel would become God’s people once again (Rom. 9:25-26; Hos. 1:9-11; 2:23). But for Paul, he laments about Israel’s salvation and their zeal for God yet chastises them for a devotion not based on their knowledge of God’s righteousness, instead substituting it with an earnestness for the law (Rom. 10:1-3). He then pivots this haphazard approach and asserts that Christ is the fulfillment of the law (Rom. 10:4; cf. Matt. 5:17-18; Luke 24:44; John 1:17; Gal. 3:13, 24; Heb. 9:7-14; 10:8-14), and it is through faith in Him only is what demonstrates righteousness (Rom. 3:26-31; 8:4; 10:9-14; cf. Isa. 53:11; Matt. 3:15; Acts 13:39 1 Cor. 1:30) because believers are no longer under the law, but “under grace” (Rom. 6:14). In Paul’s metaphor of the olive tree, God cut off the “natural branches” because they had renounced their covenant status as a result of their unfaithfulness, a theme prevalent in the Old Testament (Psa. 37:9, 22, 28, 34, 38; 101:6-8; Prov. 2:21-22; Isa. 48:18-19; Jer. 6:2; 44:7-12; Hos 8:1-4; 10:1-15; Nah 1:15; Zeph. 1:4-6; Zech. 13:8-9; cf. 1 Kgs. 9:7; 14:10, 14; 21:21; 2 Kgs. 9:8; 10:32; 2 Chr. 22:7). Juxtaposed against an Israelite being “cut off” from the “root,” in faith, they could be “grafted” back into the olive tree (Rom. 11:20-24). Nevertheless, God paved a way for Israel’s return through a genuine faith (Rom. 11:23), thereby benefiting from the promises once made to them, and fulfilled only because His grace and mercy had extended to them regardless (Rom. 10:21). Paul claims that his mission to the Gentiles is God’s proclamation to the northern tribes of Israel shrouded in God’s merciful hand for their return in righteous faith (Jer. 3:11-12). He focuses on a phrase which the Old Testament prophet Hosea heralded as a foreboding reality for these tribes, and when the Assyrian horde marauded their way into the northern kingdom, the Israelites were dispersed, becoming Gentiles themselves and their election status all but lost (Hos. 7:8; 8:8). Israel was bodingly swallowed up, ethnically diluted and had become worthless vessels (Rom. 9:21). Paul then reapplies these vessels, which was once attributed to the house of Israel, and systematizes a theological augmentation of this cryptic theme, appropriating it to Gentiles (Rom. 9:23-34). The house of Israel was cast out only to return as God’s people once again, a “mystery” solved in Paul’s ministry to the Gentiles. Paul claims that once the “fullness of the Gentiles” has been achieved, “all Israel” will be saved (Rom. 11:26). A mystery to Paul, the “fullness of the Gentiles” has long perplexed theologians and scholars as to what this phrase comprehensively denotes, and a myriad of interpretations have been posited since the early church. Nevertheless, Michael Heiser writes that in the “Old Testament, the divine plan of Jewish belief in Jesus as Messiah was preceded by something Paul referred to as ‘”the fullness of the Gentiles” (Rom. 11:25).” Interestingly, this mysterious phrase can be traced back to Jacob’s blessing over his son Joseph’s two half-Israelite children, Manasseh and Ephraim. Manasseh was the older son, however, Jacob breaks tradition and blesses the younger son, Ephraim, first. Jacob prophesies that his descendants would “become a group of nations” (Gen. 48:19) to which Paul resolves that Gentiles are the long-lost seed of Ephraim. This mystery of God at work points to the return of the northern tribes in “fullness” and reuniting with the house of Judah (Jer. 30:3; 31:31; 33:14; 50:4; 51:5; Hos. 1:11; Heb. 8:8). Paul firmly believed his mission to the Gentiles was the catalyst in God’s plan to fulfill His promises to Israel. **Paul’s theological term, “all Israel’ is the remnant of Abraham’s seed who call on Jesus Christ as their Lord. It is a theological and covenantal composite of Jews and Gentiles, and once the fullness of the Gentiles is complete, God’s promises to Israel will have been fulfilled, their salvation secured with the nations as beneficiaries. Paul’s work as an evangelist for the Gospel of Christ was a mission to the Gentiles cloaked in God’s mysterious promise to Israel. Because the northern tribes essentially became Gentiles themselves, the apostle’s mission was dually-thematic, corporately and theologically centered around the return of Ephraim’s seed, the lost House of Israel, and the outreach into the regions beyond (2 Cor. 10:16; cf. Rom. 15:24; Isa. 11:11). Paul’s use of “All Israel” in Romans 11:26 is therefore a theological motif predicated on the reunification of the twelve tribes in the Gentile mission, commencing with Paul, onto the present and future, which will inevitably result in the salvation of remnant Israel in toto under Jesus Christ, fulfilling God’s promises comprehensively. As for the 21st century church, it must continue the efforts of Paul, fulfilling the Great Commission of the Lord Jesus Christ, so that God’s promises to Israel, and anyone who believes, will be realized in full. Barclay, John M. G., Paul and the Gift. Grand Rapids, MI: Eerdmans, 2015. Das, Andrew A., Solving the Romans Debate. Minneapolis, MN: Fortress Press, 2007. Drane, John, Introducing the New Testament. Minneapolis, MN: Fortress Press, 2011.
du Toit, Philip la Grange. “The Salvation of ‘All Israel’ in Romans 11:25-27 as the Salvation of Inner-Elect, Historical Israel in Christ.” Neotestamentica 49, no. 2 (July 2015): 417–52. Heiser, Michael, The Bible Unfiltered. Bellingham, WA: Lexham Press, 2017. Metzger, Bruce M., The New Testament, its background, growth and content. Nashville, TN: Abingdon Press, 1983. Miller, Glenn T., “Romans 4.” Interpretation 69, no. 2, (April 2015): 215–17. Zoccali, Christopher, “And So All Israel Will be Saved: Competing Interpretations of Romans 11.26 in Pauline Scholarship,” Journal for the Study of the New Testament 30, no. 3,, (2008): 289-317. My /The mystery is the fullness of the Gentiles, when God has finished bringing the nations into His family – Rom. 11:25; cf. 16:25; Matt. 13:11; Luke 21:24; John 10:16; Eph. 3:3-9; Rev. 10:7). I agree that the “all Israel” in Romans 11 is the consummated righteous remnant of all twelve tribes of Israel. I have been teaching that for years. 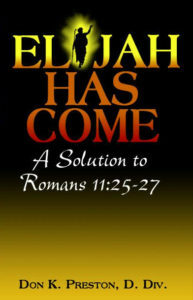 I develop that in my book: Elijah Has Come” A Solution to Romans 11:25-27. (Which I assume you have not read). I certainly agree that Paul saw his ministry to the Gentiles as the means to convert Israel (Romans 11:11f). But, that does not mean that he perceived the Gentiles as Israel. In spite of several points of agreement, I find several significant lacuna in your exegesis which I find to be fatal to your final conclusion especially. Perhaps you can clarify, but on the one hand you seem to fully identify the Gentiles as the Israelite Diaspora, while on the other hand you seem to identify them as the non-Israelite nations into which the Diaspora was scattered. I positively disagree that the Gentiles in Romans 11 are the Diaspora. For Paul, his mission to the Gentiles was to make “Israel” jealous (Romans 11:11f). His mission was not to Israel to make Israel jealous. That would be a tautology. “Wherefore, there are but two tribes in Asia and Europe subject to the Romans, while the ten tribes are beyond the Euphrates until now, and are an immense multitude, and not to be estimated by numbers.” ANTIQUITIES, BK 11, CHAPTER 5, 2 (P. 294), Whiston translation, Unabridged, (1987) Ant. 11:133). Paul likewise said that the Gentiles, were not of the natural “root” but were being grafted into the one Root, i.e. the Abrahamic promises, thus fulfilling Genesis 12 that in Abraham “all nations of the earth” would be blessed. In contradistinction to the Gentiles being grafted into Israel’s root, Israel had been cut off. The conversion of the Gentiles was a means to make Israel jealous so that they too would be converted. The Gentiles are patently not the Israelites in Paul’s discussion here. I discuss this extensively in my “One Root, One Kingdom: All Nations.” (Which I assume you have not read). For if God did not spare the natural branches, (i.e. Israel) He may not spare you (Gentiles) either. Therefore consider the goodness and severity of God: on those who fell, (Israael) severity; but toward you, (Gentiles) goodness, if you (Gentiles) continue in His goodness. Otherwise you (Gentiles) also (Like Israel) will be cut off. And they also, (Notice the “also” which is Israel in addition to the Gentiles, not AS the Gentiles) if they (Israel) do not continue in unbelief, will be grafted in, for God is able to graft them (Israel) in again. (Notice this “again”– the Gentiles had never been part of the Root like Israel was. But, Israel would be grafted in “again.” For if you (Gentiles) were cut out of the olive tree which is wild by nature, (The contrast of wild versus cultivated is an undeniable contrast of identity) and were grafted contrary to nature into a cultivated olive tree, (The Abrahamic Root) how much more will these, who are natural branches, (Israel) be grafted into their own olive tree? I see no way that one can equate Israel with the Gentiles in Paul’s discussion. Paul assuredly did not envision a protracted two millennia process of the salvation of the remnant. Not only that, the prophetic sources of Paul’s expectation falsify any extrapolation of that process beyond the first century. Therefore by this the iniquity of Jacob will be covered; And this is all the fruit of taking away his sin: When he makes all the stones of the altar Like chalkstones that are beaten to dust, Wooden images and incense altars shall not stand. Yet the fortified city will be desolate, The habitation forsaken and left like a wilderness; There the calf will feed, and there it will lie down And consume its branches. When its boughs are withered, they will be broken off; The women come and set them on fire. For it is a people of no understanding; Therefore He who made them will not have mercy on them, And He who formed them will show them no favor. Israel’s sin would be taken away, when the Temple would be destroyed, the altar turned to chalkstones, the people that God had created would find no mercy. What we find here is Israel’s salvation through -and at the time of – judgment. “There was, in other words, a belief hammered out not in abstract debate, but in and through poverty, exile torture and martyrdom, that Israel’s sufferings might be, not merely a state from which she would, in YHWH’s good time, be saved and redeemed, but paradoxically, under certain circumstances and in certain sense, part of the means by which that redemption would be effected.” (N. T. Wright, Jesus and the Victory of God, (Minneapolis; Fortress, 1996), 591). “God who abhors injustice and oppression, will come to set things right– as even the gloomy book of Amos affirms– but that setting-right necessarily entails a day of reckoning for those who have violated God’s covenant and abused His creation. That is why John the Baptist, the preliminary herald of God’s kingdom, proclaims a message of repentance (Mark 1:4): Israel must turn from its evil ways in preparation for God’s coming. Consequently, the theme of eschatological restoration is inextricably interwoven with the theme of inbreaking judgment, both in Israel’s Scripture and in Mark’s Gospel.” (Richard Hays, Echoes of Scripture in the Gospels, (Waco; Baylor University Press, 2016), 19f). I discuss all of this extensively in my Elijah book. Following the “in that day” referents of Isaiah 26-27 reveals that this salvation would come when “the earth will no longer reveal its blood” (26:21- at the Day of the Lord / resurrection). As Kline noted, this is the promise of the vindication of the martyrs (“Meredith G. Kline, Death, Leviathan and Martyrs: Isaiah 24:1-27:1″ A Tribute to Gleason Archer, ed. by Walter C. Kaiser Jr. And Ronald Youngblood, Chicago; Moody Press, 1986), 229-249). Now, unless this is a totally different vindication of the martyrs at the Day of the Lord from what Jesus promised in Matthew 23, we have every right to apply Isaiah to AD 70. But, that means that when Paul anticipated the fulfillment of Isaiah 27 he was looking to the imminent judgment of Jerusalem and Judah. This dovetails with Romans 9:28. ACCUSATION – God accused Israel three times of shedding innocent blood and violence (v. 5f). ACKNOWLEDGMENT– Israel confess her sin (her sins mounted to heaven- v. 10f) But, she does not repent. He saw that there was no man, And wondered that there was no intercessor; Therefore His own arm brought salvation for Him; And His own righteousness, it sustained Him. For He put on righteousness as a breastplate, And a helmet of salvation on His head; He put on the garments of vengeance for clothing, And was clad with zeal as a cloak. According to their deeds, accordingly He will repay, Fury to His adversaries, Recompense to His enemies; The coastlands He will fully repay. Thus, like Isaiah 27, Israel’s salvation (the salvation of the remnant – “those who call on My Name”) would be at the judgment, when “the enemy comes in like a flood” (v. 19). And, like Isaiah 27 that salvation at the Day of the Lord would be in vindication of the martyrs. The salvation of “all Israel” in Romans 11 would be in fulfillment of Isaiah 27 and 59. The salvation of “all Israel” (the righteous remnant) in Isaiah 27 and 59 would be when Israel was judged for shedding innocent blood– i.e. at the vindication of the martyrs. Jesus said that all of the blood, of all the righteous, all the way back to Creation, would be avenged in his generation in the judgment of Jerusalem (Matthew 23:33ff. Therefore, Isaiah 27 and 59– and thus, Romans 11:25-27 – was fulfilled in the judgment of Jerusalem in the first century. In addition, I should point out that judgment exudes from the text of Romans 11, if we are attuned to other passages that Paul cites. “Much as we might like to hope for a sudden universal unhardending, this is simply not how the notion of ‘hardening’ itself functions. As we saw, the ‘hard and impenitent heart’ of 2. 4-5 was what came about when the ‘kindness’ of God, meant to lead to repentance, was refused, so that the ‘hardening’ was the prelude, not to a sudden mercy despite the lack of repentance, but to judgment. This is cognate with the ancient biblical idea (not least in the Abraham-narrative and its exodus-promise) of a nation’s sins being ‘filled up’ to the point where judgment was the only remaining possibility. ” (N. T. Wright, Paul and the Faithfulness of God, (Minneapolis; Fortress, 2013), 1237). To ignore the fact that Israel’s blindness was indicative of impending judgment is to ignore the consistent prophetic corpus. Thus, when Paul spoke of the blindness of Israel of his day, he was very powerfully, even if implicitly, pointing to their judgment. Paul did not envision the bringing in of the remnant of Israel as an on-going, two millennia process. It would be a “short work.” Two millennia is not a short work. Israel’s soteriological history would be climaxed when the righteous remnant of the twelve tribes was saved, resulting in the blessings of that fulfillment flowing to all nations. This is Isaiah 66:15ff. That climax of Israel’s history would be when Israel was judged for shedding innocent blood. It would be when God would no longer have mercy on the people He had created (no more distinctive, nationalistic “grace”). It would be when the fortified city was desolated and the altar turned to chalkstones. Thus, your conclusion that Romans 11 extends into our future is not tenable. It is an anachronistic application of the text.